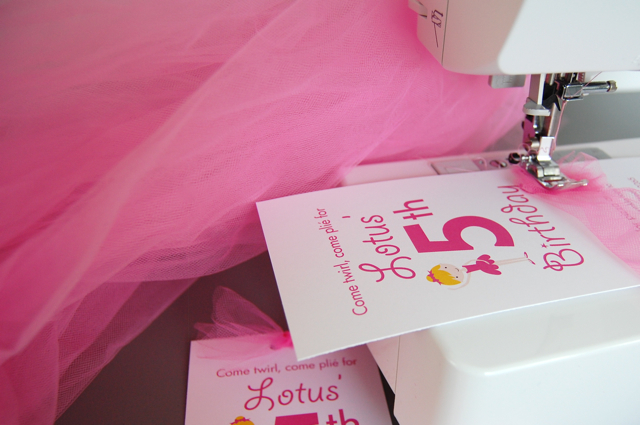 In an attempt to keep things sort of easy-going this year, we're celebrating Lo's birthday a little early with two small parties – one for her little girlfriends and another for immediate family. (My due date with baby #2 is really close to Lo's birthday, so partying early is the way to go.) 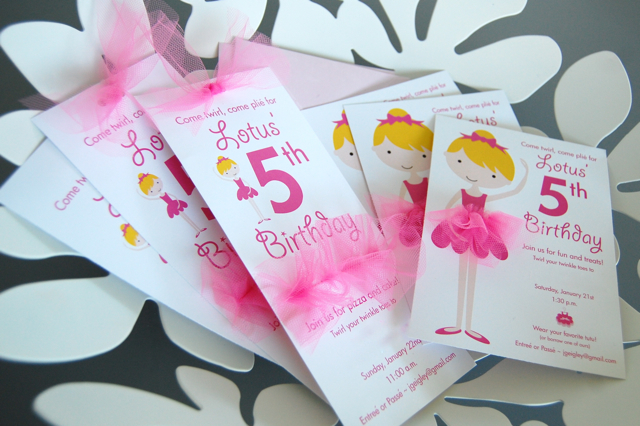 Lo has has fallen in love with ballet this year, so we decided to do a ballerina birthday party (with lots and lots of pink.) I had two ideas for invites, and both involved tulle. 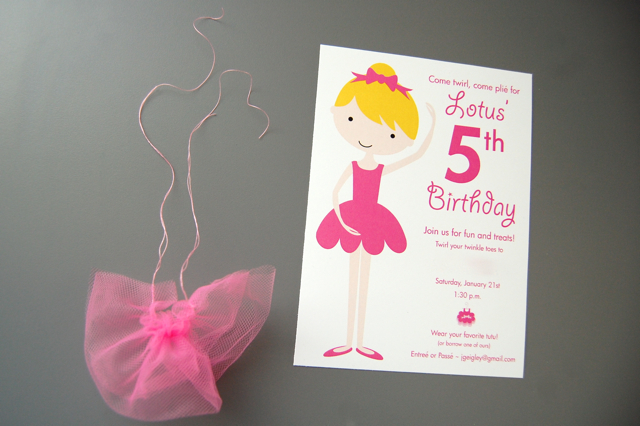 So two parties gave me an excuse to made two versions of party invites: one with ruffles, the other with tiny tulle tutus. 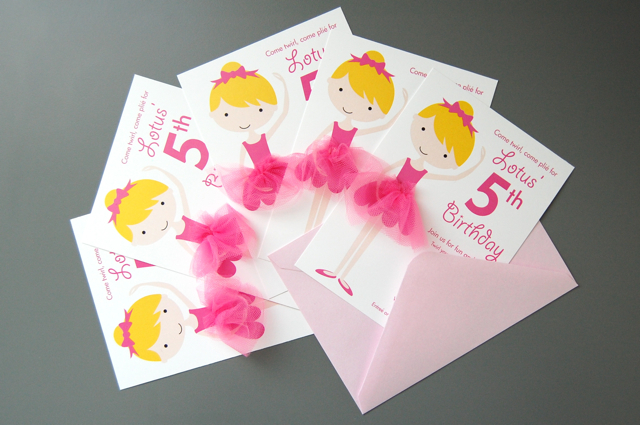 What little girl wouldn't love these? 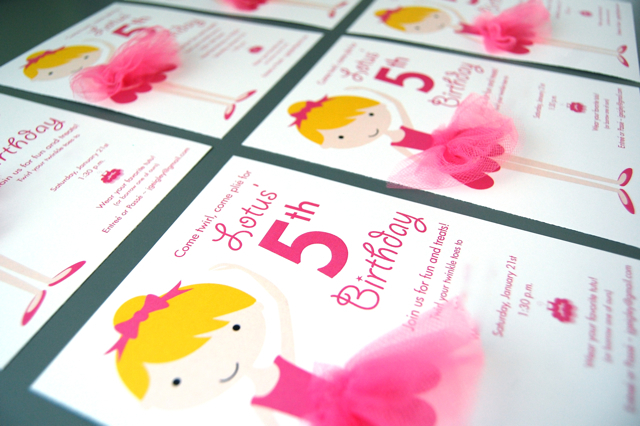 First up is a ruffly vertical A10 invite (which is 1/3 of an 8.5x11 sheet of cardstock.) This one is the more simple/freeform of the two invites, and even if you're not an ace with the sewing machine, you can totally pull this off. I did the layout of the text and graphics in Adobe Illustrator. (The ballerina graphics are from Cocoa Mint.) 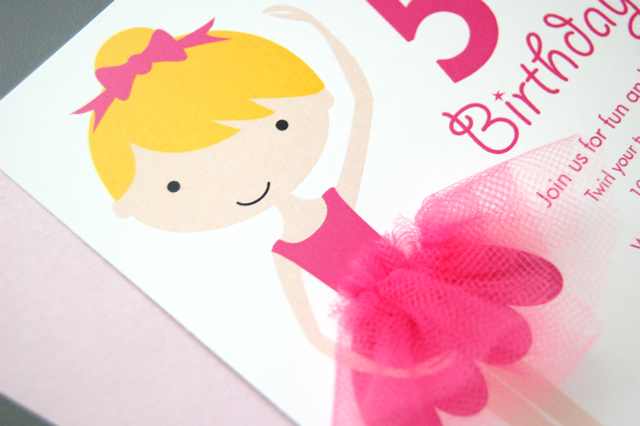 Then I punched two holes on the top of the invite and tied a strip of tulle through the holes to make a little bow. 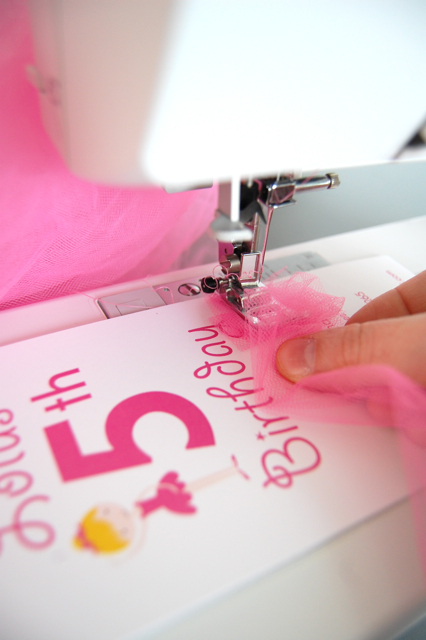 Starting with your bunched-up strip of tulle, slowly sew a single line of stitches across your cardstock using coordinating colored thread, continuing to bunch the tulle in front of the presser foot as you go. You'll be sewing right down the center of your strip of tulle to make the ruffle, and the tulle will fluff out on each side of your stitched line. Trim off any extra tulle when you get to the opposite edge. Trim the threads hanging off each side, and also on the back of the invite. That's it! Quick and simple. 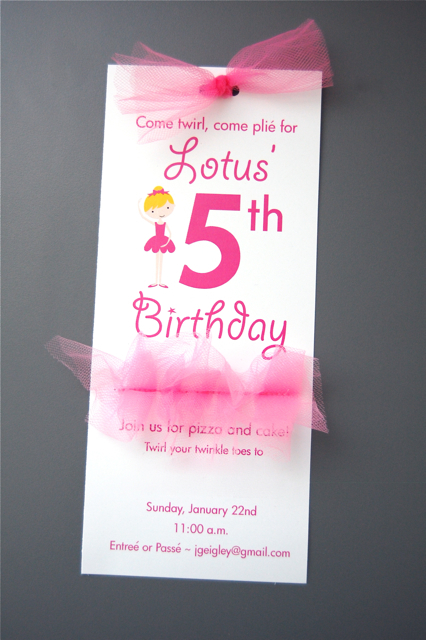 The second invite (for the little girls' party) involves making a tiny pink tutu. I just loved making these, although I'm not all that fantastic at sewing and it took some trial and error to find the best way to make tiny tulle skirts. 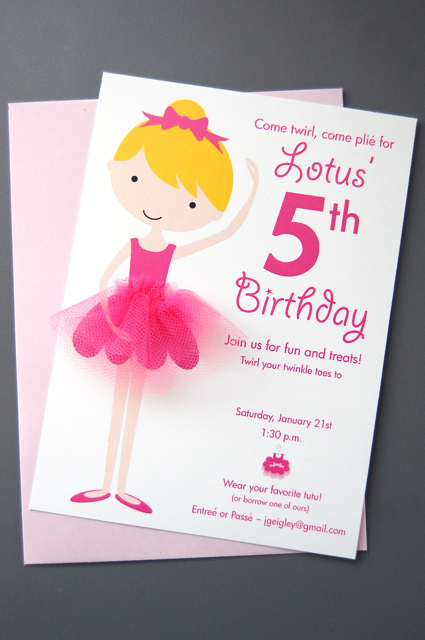 Again, I started with a ballerina graphic (from Cocoa Mint) and text similar to the first invite. The fonts, if you're at all curious, are a combination of Futura and Giddyup. These invites fit an A6 envelope, and I measured my tulle according to the size of my ballerina's skirt. Again, I used strips of tulle that were 4" wide and about 8" long. 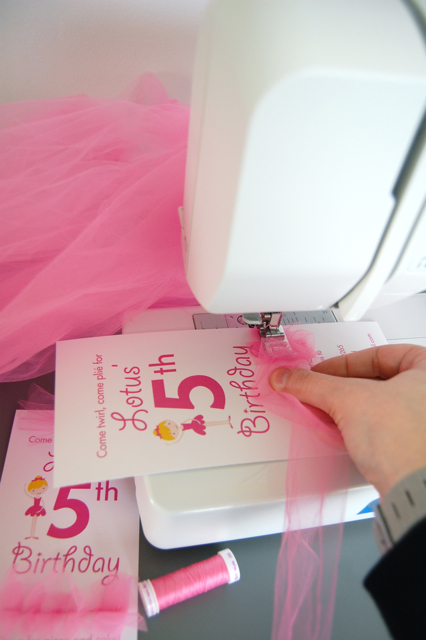 This time, you will once again fold the strips in thirds the long way, making a nice triple layer of tulle. Then, sew along one of the long sides, 1/4" from the edge. Do not cut the threads hanging from each end of your tulle strip. Take one of the tail threads from each end of your strip and pull. (There should be two threads on each end of your strip. One will pull, one will not.) As you tug from each side, the tulle will gather. 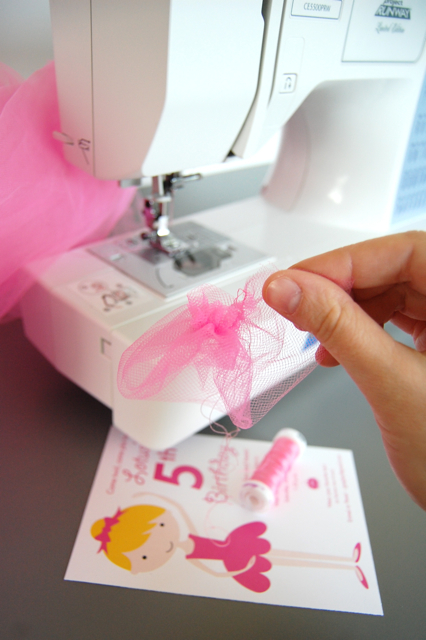 Keep pulling until all of your tulle puffs up into a tiny skirt, like in the pic above. It will form a ring that looks sort of like a waistband. Take the four threads (two from each side) and securely knot them together in the back where they meet. Trim the threads close to the knot. 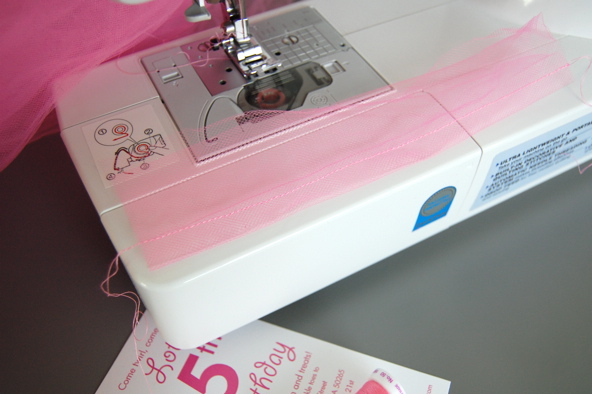 Using a hot glue gun, make a little line of glue along the ballerina's waist and glue down the tutu with the 'nice' side of the skirt facing out. You could also try sewing these down, but I personally had better luck with the glue. These are absolutely amazing! You're an awesome mama! to...should be too with 2 o's.